Who said that Tokyu Hands didn’t have a sense of humor. I cannot think of a single image that is so defining of a world leader, than this angry, loud-mouthed one that seems to have gone ubiquitous. Update to the JapanesePhotos Instagram at: http://bit.ly/2gLpQ7Z. At the World Cosplay Summit. Many cosplayer fans flock annually to Oasis21 in Nagoya for this night of nights. Update to the JapanesePhotos Instagram at: http://bit.ly/2arCUAl. The Nagoya based World Cosplay Summit (WCS) will be promoted on All Nippon Airways (ANA) flights in February and March this year. It seems to be a part of the “Cool Japan” public relations the Japanese government has been promoting for a little over a decade now. The short video will have both English and Chinese subtitles. A preview can be seen here, https://www.ana-cooljapan.com/contents/cosplay/ Unfortunately, their campaign doesn’t seem well planned, especially with the title, “Is Japan Cool?”. I’ll let you answer that for yourself. The photo above is from the 2012 Taiwan contingent on the red carpet event in the hot August morning. This Photo of the Week comes from the World Cosplay Summit. It was on on the weekend just gone. This year I was unfortunately busy with other things, and so I couldn’t go myself. Today I learnt on Twitter that the Italian team had won the competition, well done to them. Though this is a past photo, and I may have already shown this as a POTW before, it is my absolute favourite cosplay photo. This fan, like most others, would have spent many, many long hours preparing this one particular outfit, and then perhaps equally lots and lots of money buying all the materials to make it herself. No wonder why the sewing machine manufacturer has sponsored this event in the past. So, I present to you Misa Misa from the fantastic comic book and TV series, also made into a fantastic movie, Death Note. For this, and more see my World Cosplay Summit portfolio, and previous cosplay blog posts for more info. Ahead of a photo shoot with Ai Tsukamoto, one of Japan’s leading jazz dancers, I picked up a hotshoe flash diffuser. I needed something portable, and to soften the light at least a little from the hotshoe flash. The hotshoe flash does create harsh shadows. The worst shadows are the ones from a point-and-shoot camera that people use at birthday parties. Remember the large spooky shadows behind the happy victims? A diffuser makes things look a lot more natural, and less spooky. The other advantage is with using a flash, is you can re-create natural light using a reasonably powerful light source, so you can use sensible camera settings. With a flash you can use shutter speeds like 1/200 which prevents camera shake blurring photos. You can use an aperture of about f4.5 to f9 so your subjects’ noses and eyes both appear in focus. You can also use iso100 for maximum image quality. Also, if you move the flash off camera, and to the side it does start to look more interesting. See my photo of a crab at night as an example. To trigger your flash off camera, you can use connecting cables or a radio signal system, like the ones made by Pocket Wizard and Cowboy Studios. Below are some photos showing how the diffuser looks, and then photos of the results you can get. As you can see, the diffuser fits onto any hotshoe flash with its elastic velcro straps quickly and easily. Also shown below, with the flash pointing up, and bouncing light off of the diffuser you can get even softer light and shadows, as demonstrated in the cosplay photo below. The diffuser folds up small, and fits into a slim case, which makes it easy to pack. Click on the thumbnails to see larger versions of them. Below, the flash and diffuser was used off camera and held in the hand to the left (holding the camera only with the right hand. The flash was straightened, and not pointed at the girl, and the diffuser was set to bounce the light. The flash was connected to the camera with Minolta flash cables, and if you’re wondering, I used the Sony A77, with the Minolta 5400HS flash set to manual. Also, check out the Ai Tsukamoto portraits, too. Many of my World Cosplay Summit 2012 photos are located between my agent’s website Asia Photo Connection by Henry Westheim and my PhotoShelter portfolio in the World Cosplay Summit, World Cosplay Summit 2010, and World Cosplay Summit 2012 galleries. This Photo Of the Week (POTW) is from the World Cosplay Summit (WCS) red carpet event before the championship held on Saturday, 4th August 2012. Aichi TV is both the main sponsor and broadcaster of the event. I was lucky enough to get a press pass so that I could get good access to the competitors. This year there are competitors are from 20 countries including Italy, Finland, Indonesia, South Korea, and the UK. The event was won by the Japanese team, although the Singaporean and Thai teams were tied at equal first on audience vote. The Singaporean team was officially anointed second, and the Indonesian team third. The photo below is of Valerie from Singapore just after the red carpet event held that morning. Behind her is the Sunshine Sakae building famous for hosting the popular J-pop group SKE48 and it’s landmark ferris wheel. This image, and others like it, are available for print, product, personal use (eg: non-commercial blogs), and for media licensing at my PhotoShelter portfolio. Congratulations to Valerie and Frank for taking second place at the WCS. (Note: the original photo is now no longer available, this is Valerie on the red carpet event). The World Cosplay Summit (WCS) is this weekend in Nagoya. It’s an international celebration of the Japanese comic book industry. The cosplayers make their own costumes based on characters in popular comic books (aka “manga”). 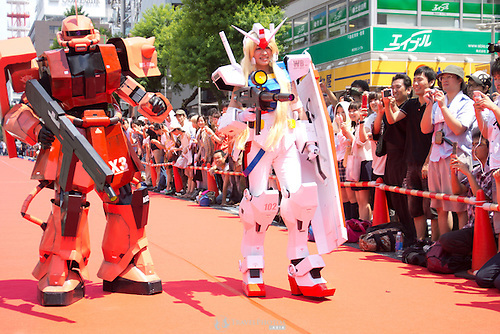 Usually, the fans will dress up and sport their best with other cosplayers, and the international competitors do a performance on a stage in front of a huge crowd of about 10,000 spectators, and perhaps a million on TV. A notable sponsor is Brother, the sewing machine company. This photo of the week is for the cosplay fans. This was taken during the 2010 World Cosplay Summit, in Nagoya.